It’s that time of year— you or someone you know has resolved to lose weight or increase their health. This is the perfect special to make it happen. Last month we offered a free box of ProArgi-9+ with the purchase of any one of our new SLMsmart packs. Due to its tremendous success, we’ve extended the special into this month as well! 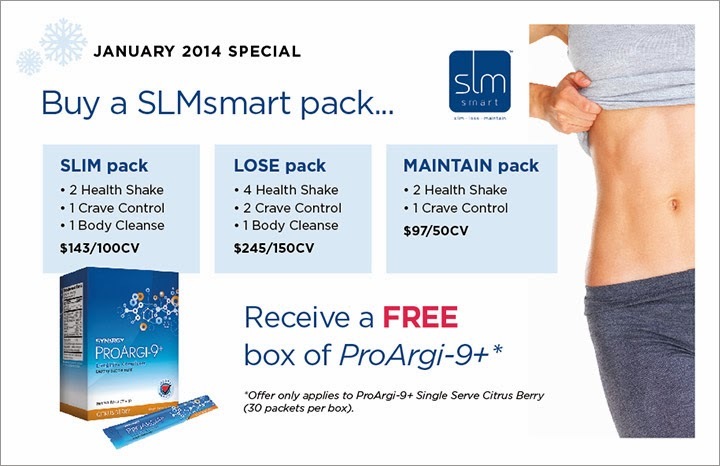 Act now, order your SLMsmart pack, and enjoy the ability to Slim, Lose or Maintain along with the benefits of ProArgi-9+. For a brief explanation about the new packs click here. To order, log into pulse or call Customer Service at (801) 769-7800.